Feline Design Cat Furniture! Rugged & stylish sisal rope cat furniture, scratching posts and condos, bulk sisal rope & much more! "Bookmark us today.... ...find us easily tomorrow!" To shop our site, please click a photo to visit its corresponding web page. 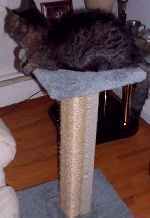 <--See how our superior columns can UPGRADE your cat tree. Find out why you shouldn't buy cat furniture from the national pet supply chain stores! Feline Design Cat Furniture and the "three cats in the window" design, as well as the stylized "Feline Design" with cat are all registered trademarks of Feline Design Cat Furniture. All material on this web site Copyright © 1986-2019 by Feline Design. No part of this web site is to be reproduced except for private use.